The Nordic Border Stencil is fantastic for adding authentic Scandinavian style to contemporary interiors and for festive decorating projects. This border stencil comprises two Nordic style borders. A simple Nordic star border and a deeper more detailed snowflake, daisy and dotty border. See size and layout specifications below. 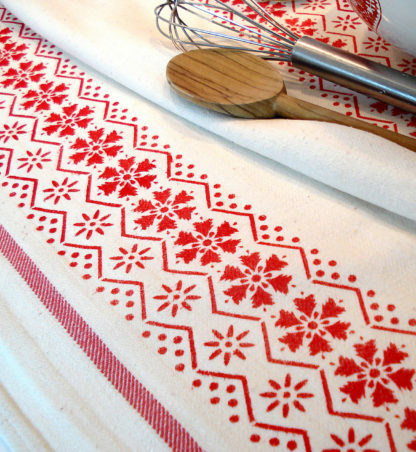 Above top and below – we’ve added the two Nordic Border motifs of this pack to two woven striped tea towels (inexpensive ones from well known supermarkets!). 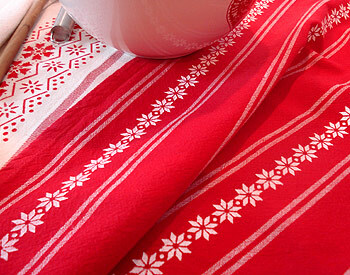 Stencilled in Strawberry Red and Pure White Fabric Paint – between the stripes. A very effective way to create a festive touch for your Christmas kitchen, or for special gifts with a personal designer touch! Also see Nordic Pattern Stencil 1 and Nordic Pattern Stencil 2, similar motifs to this design, but in deeper pattern blocks rather than double repeat wider borders. 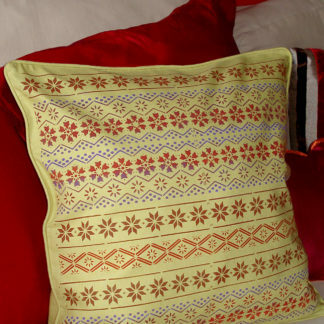 Above – add instant colour and Nordic style to your festive decorating! 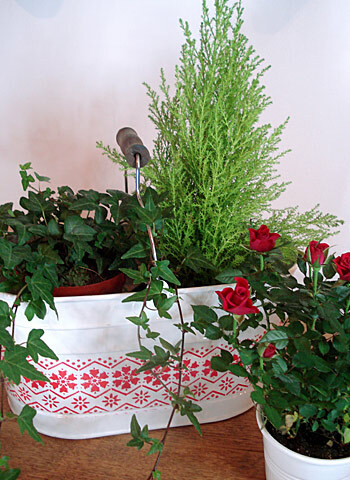 Here the snowflake motif border of the Nordic Borders Stencil has been stencilled in Very Berry Stencil Paint onto a wide enamel bucket for a festive plant and flower display. 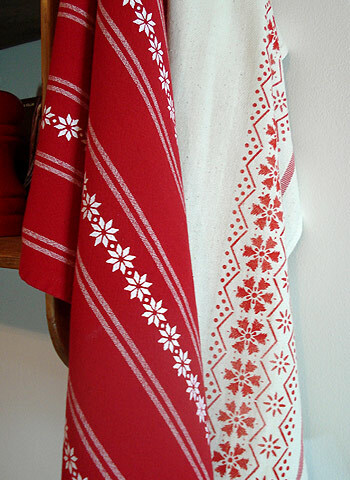 Above – both motifs of the Nordic Borders Stencil in Very Berry Stencil Paint on a cream coloured background. 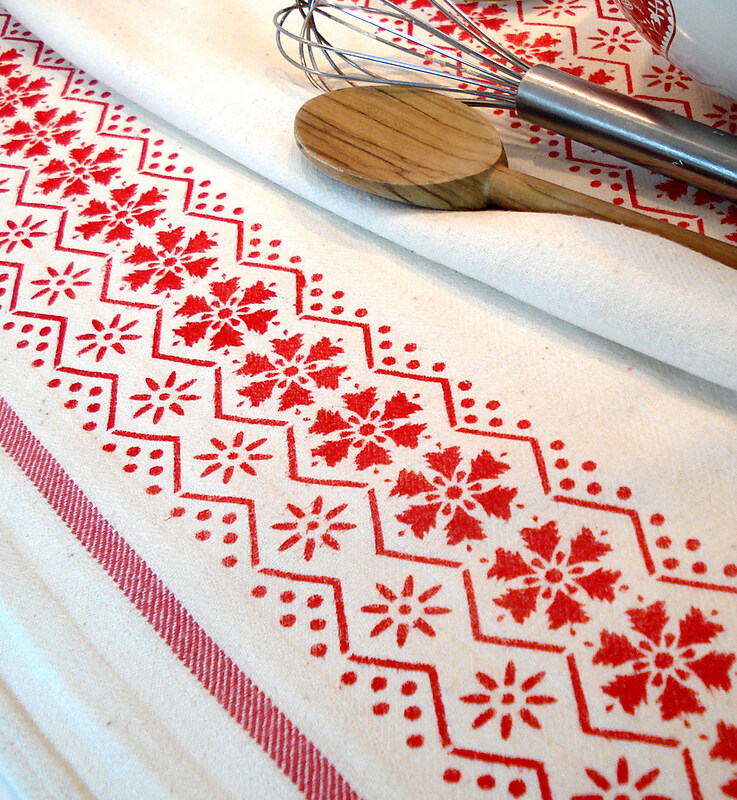 Above – the two Nordic Border motifs stencilled on striped tea towels. 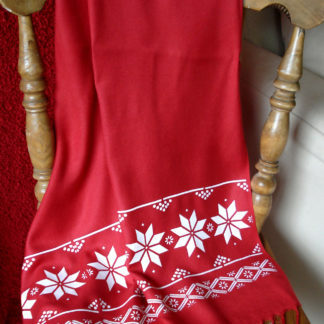 Great for bringing instant festive cheer and practical at the same time. Stencilled in Strawberry Red and Pure White Fabric Paint – between the stripes. Fix Fabric Paint on your tea towels by ironing the reverse side with a hot iron – they will last wash after wash. Above – use a simple bright colour palette to create up to date style. Nordic Borders Stencil shown here in Very Berry, Atlantic Blue, Summer Skies and Oasis Stencil paints. The Nordic Borders Stencil comprises two single layer Nordic motif repeat borders on one sheet of on 125 micron Mylar. Comes with registration dots for easy alignment of repeats and usage instructions. Snowflake border (top) is approximately 8cm/3.25″ deep and one repeat is 46cm/18″ wide. With registration dots. Small star border (bottom) is approximately 1.8cm/.75″ deep and one repeat is 47cm/18.5″ wide. With registration dots. 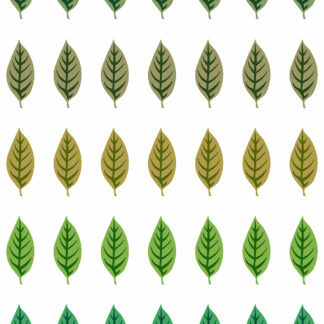 Sheet size 52cm/20.5″ Wide x 20cm/8″ deep. Left – the Nordic Borders Stencil sheet showing the layout of both border motifs and registration dots.